ادوین فن در سار (اینگیلیسجه: Edwin van der Sar) (دوْغوم:۲۹ اوْکتوبر ۱۹۷۰(1970-10-29) ‏(۴۸ یاش) Voorhout) بیر فوتبالیست. هولند میلّی تیمی ترکیبینده چیخیش ائدیب و قولر موقعیتینده اوْیناییب. ↑ Hugman, Barry J., ed. (2010). The PFA Footballers' Who's Who 2010–11. Mainstream Publishing. p. 419. ISBN 978-1-84596-601-0. 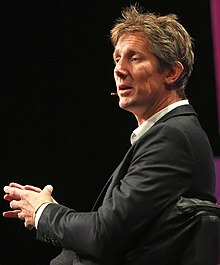 ↑ Edwin Van der Sar ESPN. Soccernet.espn.go.com. ESPN Soccernet (3 February 2011). یوْخلانیلیب3 February 2011. ↑ Edwin van der Sar Manchester United. ManUtd.com. Manchester United (3 February 2011). یوْخلانیلیب3 February 2011. ↑ White, Jim (2008). Manchester United: The Biography. London: Sphere. p. 425. ISBN 978-1-84744-088-4. ↑ Edwin van der Sar - Century of International Appearances. قارداش پروژه‌لرده ادوین فن در سار گؤره داها آرتیق بیلگی‌لر تاپابیلرسینیز.